Deep water Games and Distribution forms with an immediate partnership with Asian game production powerhouse, EMPERORS4! Deep Water Games and Distribution has announced a partnership with EmperorS4 for North American distribution of FOUR of the Asian company’s hottest titles. The startup, founded by KrakenPrint CEO Jacob Way, N3 Art founder and game developer Nolan Nasser, and Source Point Press Editor-in-Chief Travis McIntire, aims to immediately hit the ground running and have games in the hands of eager fans by March of 2018. HERBALISM: Herbalism is a logic and deduction game for 3-4 players. In Herbalism, a pandemic is spreading throughout the country. Players take on the role of a group of novice pharmacists, hoping to find the cure to the disease! Using various actions players will exchange information to find out the exact combination of ingredients needed to cure the pandemic. SHADOWS IN KYOTO: Shadows in Kyoto is a two-player abstract game set in the world of Hanamikoji. Players take control of the Oniwaban, a group of undercover spies, or an intelligence agency of the Meiji Government. Players must secretly gather key intelligence from the opponent through movements, conflicts, and tactics. Each game there are three vastly different paths to victory! This is a quick, yet deep game with various mechanics for tuning the gameplay and complexity. CROWS OVERKILL: Crows Overkill is fun-filled party game where players must get rid of birds in front of them to sleep a little while longer. The story is based on an old song that roughly means: "When a crow cries, I must leave this place. I would kill crows all over the world, just to stay with you a little while longer." 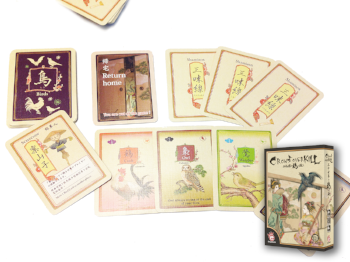 Birds gather outside each player’s door and you must play Shamisen cards to remove birds, or send birds to your opponents in this quick paced, take-that card game. HANZI: Hanzi is a memory matching game for 2-5 players. In Hànzì, players travel back 3600 years and serve as one of the pupils of Master Cang Jie. As you learn from the Master, you will create new written characters that serve as the foundation of modern Chinese culture. Not only is Hanzi a fun and engaging game, but it’s also valuable for learning Kanji! Deep Water Games and Distribution will be starting with these four titles in 2018, but are already looking further into the future with at least 2 more games slated for a late 2018 release in North America and launching some in-house developments as well.